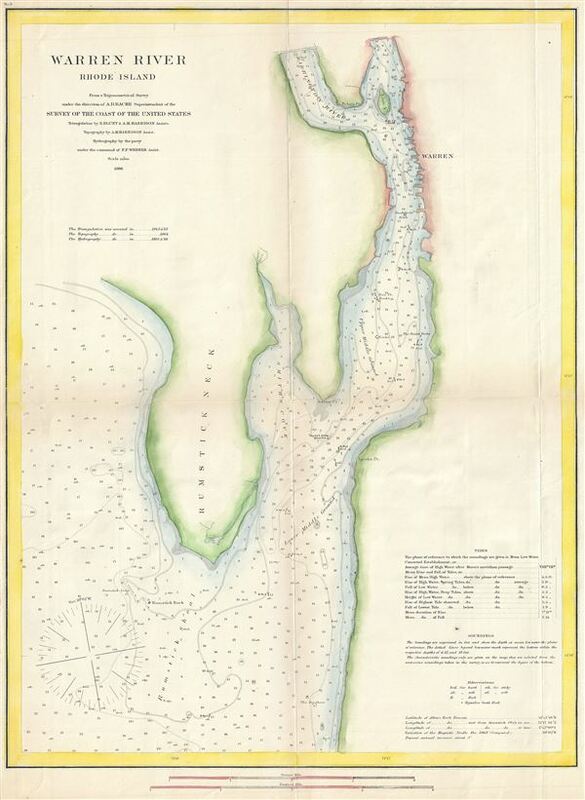 This is a fine example of the U.S. Coast Survey's 1866 nautical chart or maritime map of Warren River, Rhode Island. Centered on Rumstick Neck, the map covers the Warren River from Tyler Point south past Jacob's Point to The Brothers and its confluence with the Narragansett Bay. Barrington River, Little Island and Warren are also identified. The chart includes countless depth sounding in feet as well as detailed notes on soundings, tides and a wealth of other practical information for the mariner. The triangulation for this map, executed in 1843 and 1863 was the work of E. Blunt and A. M. Harrison. The topography by completed by A. M. Harrison in 1864. The hydrography was accomplished by parties under the command of F. P. Webber in 1865 and 1866. The whole was compiled under the supervision of A. D. Bache, one of the most influential American cartographers of the 19th century. This chart represents plate no. 9 in A. D. Bache's 1866 Report of the Superintendent of the United States Coast Survey.